Earlier this week we reported that Google has already received takedown requests for more than 100 million URLs this year. While most of the submitted URLs do indeed link to infringing content, not all requests received by Google are correct. The automated systems used by many of the copyright holders often trigger notices that include links to perfectly legitimate content, and sometimes even their own work. 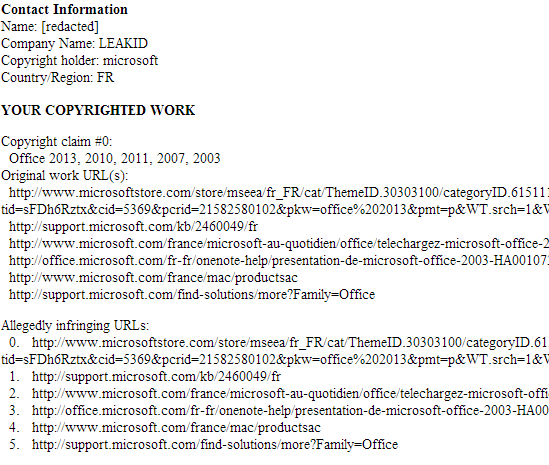 The latter happened in a recent DMCA takedown request sent by LeakID on behalf of Microsoft. Instead of listing URLs of infringing material, Microsoft asked Google to remove links to their own websites, as can be seen below. The six links point to Microsoft’s store, support pages and product descriptions. A pretty embarrassing mistake to say the least. Luckily for Microsoft, Google spotted the error, meaning that the pages in question have not been removed from the search results, although it would have been a fitting punishment if Google had decided to comply with the request. While the above error is rather entertaining, matters gets more serious when copyright holders censor legitimate content produced by others. It’s hard to say how frequently this happens, but just by browsing through the many DMCA notices we have been able to find dozens of examples already. Just two weeks ago we found that HBO had asked Google to remove a perfectly legal copy of the open source video player VLC, for example. The link in question was clearly submitted in error, but at the time of writing it’s still absent from Google’s search result. Some individuals respond to these mistakes by blaming the search engine, and taking counter-action. For example, a person who uses the handle “Google dicksuck” decided to respond to the VLC takedown request by asking Google to remove HBO.com. Unfortunately for him or her, Google did not remove the TV-network’s website. Of course Google can’t really be blamed for responding to takedown requests because they are required to do so by law. Considering the millions of notices submitted to them every week, Google does a pretty good job at filtering out the most obvious mistakes. The copyright holders on the other hand could take much more care to prevent these errors. Even if it’s just to avoid embarrassing themselves. Update: A Microsoft spokesperson told TorrentFreak the following in response to our findings.